State Rep. Jeremy Durham sent an eight-page letter to House colleagues Monday that defends himself, attacks the women who accused him of sexual misconduct and blasts House leadership for handling the investigation, reports The Tennessean. Durham threatens in the letter to release a document that would name the 22 women who accused him of inappropriate sexual conduct and show text messages that he says could prove his innocence. The women spoke to the attorney general on the condition of anonymity, afraid there could be negative personal and professional ramifications if they were identified. Durham, 32, faces an ouster vote this week as lawmakers meet in Nashville for a special legislative session. “This type of unbridled authority is dangerous,” he said while discussing the “dangerous precedent” it sets for expelling a member based on an attorney general’s report. “Due to the way this situation has been handled, my family finds itself in the position of wanting to largely clear my name by releasing names and text messages of many Jane Does while also wanting to not make the situation a bigger circus than it has already become,” Durham writes in the letter. This entry was posted in Ethics, Legislature, scandals and tagged ethics, Jeremy Durham, legislature, scandals on September 12, 2016 by Tom Humphrey. State Rep. Jeremy Durham tells WKRN-TV via text message that he plans to attend next week’s special session that will include an attempt to remove him from office — if some conditions are met. But it seems those conditions are not what House Speaker Beth Harwell has in mind. Durham, who was the subject of a scathing state attorney general report where 22 Tennessee Capitol Hill women accused him of sexual harassment, recently lost a primary bid, but he will retain his seat until a replacement is elected in November. Other lawmakers have voiced their concerns about Durham receiving pension. Pensions begin at the age of 55 and lasts for the rest of the recipient’s life. Durham’s pension, if he finishes his second term in November, would be worth about $344 per month, or $4,130 per year. House Speaker Beth Harwell said Durham had his chance. “What I understand is that the (attorney general) report serves as evidence and he will be given the chance to address the body and that’s it,” she told The Tennessean on Thursday. This entry was posted in Beth Harwell, Ethics, Legislature, scandals and tagged Beth Harwell, ethics, Jeremy Durham, legislature, scandals on September 9, 2016 by Tom Humphrey. 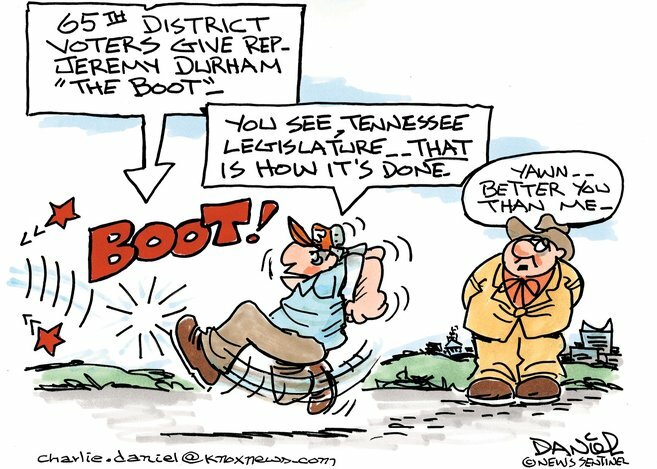 This entry was posted in Ethics, legislative campaigns, Legislature, scandals and tagged cartoon, Jeremy Durham, legislative campaigns, legislature, scandals, voting on August 9, 2016 by Tom Humphrey. Efforts to call Tennessee legislators into special session to expel Reps. Jeremy Durham and oe Armstrong from the House failed to get the needed signatures by Friday’s deadline, reports the Times-Free Press. There were two petitions — one to expel only Durham, R-Franklin; the other to expel Armstrong, D-Knoxville, as well. Both petitions fell dozens of signatures short of the required 66 or two thirds of 99 representatives needed to initiate the process. Only 27 representatives signed McCormick’s petition to oust Durham, described in a state Attorney General investigation of having inappropriately approached or sexually harassed at least 22 women, most of them state Capitol female workers, interns and lobbyists. This entry was posted in Ethics, Legislature, scandals and tagged ethics, gerald mccormick, Jeremy Durham, legislature, scandals on August 6, 2016 by Tom Humphrey. The Tennessee Black Caucus of State Legislators (TBCSL) is not endorsing a movement to return lawmakers to Nashville for a special session to vote on possible removal of embattled Rep. Jeremy Durham. An Attorney General report into the activities of Rep. Durham found that Durham sexually harassed at least 22 women during his time in office. The report was presented to a special House of Representatives committee. The committee determined that while Rep. Durham’s activities were worthy of expulsion, since this is an election year, the voters should be the ones to decide if he should return to the State House. After calls to oust Durham before November—at which point he would be eligible for a state pension–Republican lawmakers began circulating a petition to members to call for the special session. This entry was posted in Ethics, Legislature, scandals and tagged black caucus, ethics, Jeremy Durham, legislature, scandals on August 5, 2016 by Tom Humphrey. State Rep. Jeremy Durham, once viewed as a rising star among younger Republican, lost his House seat in a landslide Thursday following reports on his sexual harassment of 22 women. Challenger Sam Whitson trounced the former House majority whip, earning 3,682 votes compared to 645 for Durham, according to final but unofficial results. Stacey Givens, who pulled out of the race but did so too late to have her name removed from the ballot, received 303 votes. Durham suspended his campaign last month in the wake of a Tennessee attorney general’s report citing 22 women who alleged inappropriate sexual contact or conduct by Durham, R-Franklin. Early voting started the next day. Durham, 32, and his attorney Bill Harbison did not respond to a request for comment on Thursday. This entry was posted in Ethics, legislative campaigns, scandals and tagged ethics, Jeremy Durham, legislative campaigns, scandals on August 4, 2016 by Tom Humphrey.